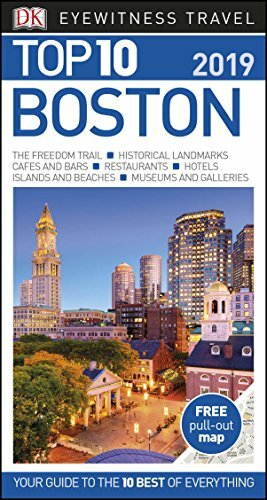 An unbeatable, pocket-sized guide to Boston, packed with insider tips and ideas, colour maps, top 10 lists, and a laminated pull-out map - all designed to help you see the very best of Boston. Walk the iconic Freedom Trail, see Trinity Church, explore the grounds of Harvard University, or step back in time at the Charlestown Navy Yard. From Top 10 Boston Harbor Islands to Top 10 things to do for free - discover the best of Boston with this easy-to-use travel guide. Inside Top 10 Boston: - Ten easy-to-follow itineraries, perfect for a day trip, a weekend, or four day trip - Top 10 lists showcase the best Boston attractions, covering the Museum of Science, Boston Common and Public Garden, Newbury Street and more - Free laminated pull-out map of Boston, plus over eight colour neighbourhood maps - In-depth neighbourhood guides explore Boston's most interesting areas, with the best places for shopping, going out, and sightseeing - Colour-coded chapters divided by area make it easy to find information quickly and plan your day - Essential travel tips including our expert choices of where to stay, eat, shop, and sightsee, plus useful transport, visa and health information - Colour maps help you navigate with ease - Covers Beacon Hill, Back Bay, North End and the Waterfront, Downtown and the Financial District, Chinatown, the Theater District and South End, Kenmore and the Fenway, Cambridge and Somerville, South of Boston and more Staying for longer and looking for a more comprehensive guide to Boston? Try DK Eyewitness Travel Guide Boston or DK Eyewitness Travel Guide New England. About DK Eyewitness Travel: DK's Top 10 guides take the work out of planning a short trip, with easy-to-read maps, tips, and tours to inform and enrich your weekend trip or cultural break. DK is the world's leading illustrated reference publisher, producing beautifully designed books for adults and children in over 120 countries.